From afar, it looks not to dissimilar to the east coast’s New York City. High rises give it an industrial look, but what this concrete jungle really does is overshadow the near 400 year history hidden within the Canadian city of Montreal. 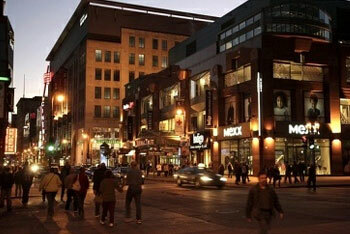 Known as Canada’s “Cultural Capital”, Montreal houses an essential part of Canada’s commerce. Being such a historical city, though, it is also a huge tourist hot spot in the vast country; and with a lot of tourism comes plenty of destination parties. Though the city is historical by nature, Montreal has no problem partying like the best of them. During the day, may come off as classical and historic, but when the sun sets, the nightlife rises. The biggest factor to any nightlife is what nightclubs are in town. Cities like Las Vegas are known for their abundance of nighttime establishments, and while you may not think of Montreal as a party city, it can give Sin City a run for its money. With clubs like The Academy, Karina, Club Cherry, and Le Loft in town, any traveler to this French city will find themselves amidst one of the hottest parties in the world. From high end dining to high energy entertainment, Montreal nightclubs are known for their welcoming atmosphere and unrivaled entertainment. Home to well over three dozen five star establishments, anybody looking to party in Montreal should have no problem finding the right place to do so. On top of housing some of the hottest nightclubs in Canada, Montreal is also home to an assortment of many gentlemen’s and strip clubs. From Bar Taboo to Karmasutra, this city can deliver both light and heavy adult entertainment. Prior to experiencing the Canadian nightlife, you’ll want to ensure you have a full stomach. Indulge in some local French cuisine at locations like Verses and Le Homard Fou or have your crack at some delectable shellfish at Les Crustaces. No matter your tastes, Montreal is home to at least one restaurant that will cater to your appetite. Some establishments will be available for some late night dining, so feel free to pop in after your time at the club. To those looking for a mild night out, but still be within range of some good liquor and worthwhile partying, Montreal is home to some exquisite bars and cigar lounges. Enjoy a toned down night at the Rib ‘n Reef cigar lounge or at the B-Side and Globe bars. You won’t find any nicer place to spend your evening than within the comfort of a Montreal-based establishment. Historical facts aside, Montreal is just as capable as being a nightlife city as any other. With its vast assortment of first class nightclubs to an array of late night dining options, this Canadian city is a welcomed edition to the party-greats known around the world. Montreal VIP is the pioneer of VIP treatment in Montreal which established in 2001. Planing from corporate events to bachelor bachelorette parties. Its one stop shop for your reservations.